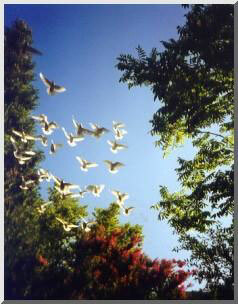 The release of white doves at outdoor memorial services has traditionally symbolized the spiritual message of hope and remembrance. A flock of doves are usually released at the close of the ceremony, all except one, which is released a few seconds after the others. The flock circles overhead several times representing angels waiting for their loved one to join them (or the hopes and prayers of friends and family.) The lone dove wings after the others, symbolizing the departed sprit making its final journey home. If there is more than one soul to be remembered, a single dove can be released to represent each one. White Dove Release doves were released at the September 11th Memorial Service held at the New York New York.